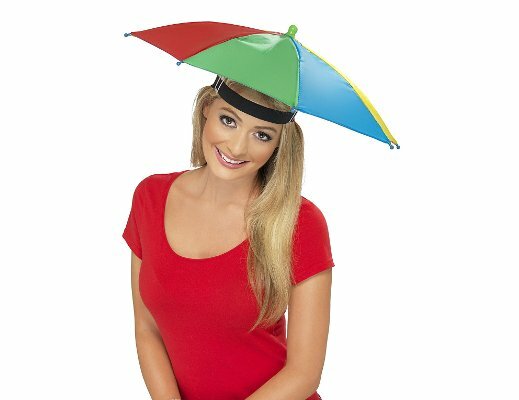 It’s not often things that really are the best inventions since sliced bread come along, but here we have a strong contender for that coveted position: the umbrella hat! It’s a no-brainer, really. A hat and an umbrella. A hands-free umbrella. Your own, personal, portable mini shelter from the rain that never wanders from your precious noggin. Any skeptics of this most superior accessory need only to consider the less-than-appealing alternatives to grasp its true genius. Rain jackets, for example, are yet another layer of clothing, often unbreathable – probably not what you want if it’s muggy and humid outside. Plus, they rely on hoods to keep the head dry, but hoods are just plain annoying, inhibit the vision, and miserably fail to keep the face dry. Not to mention that long hair will always find a way to slip out of a hood to whip into the face in soggy strands. Yuck. One could always wear a hat, if they really wish to wrangle and mash their carefully styled hair into such constricting contraptions. How many hats are waterproof, anyway? And how many have a brim that adequately shelters the face from the ravages of oncoming rain? A standard umbrella may be the rain-protector of choice for many, but it efficiently occupies the full attention of one hand, making it very difficult to take pictures, look at your phone, zip up your jacket, or do anything really. Why live life in such a hindered manner? There is also the option of uttering a rain-defying magic spell but all in all, we’d place our bets on better rates of staying dry with the ever-practical, no-nonsense, hands-free umbrella hat. This accessory is clearly the best solution for happy and dry heads. Wear it to festivals, carnivals, sports games, while waiting for the bus… with a head band to keep it in place, it’s not going anywhere except where it should – hovering right above the head of its human master.